If you watched any type of news broadcast today I’m sure you heard that today is Elvis’ birthday and he would have been 77 years old. I LOVE Elvis. I’m not sure when my love for Elvis started, considering I had just turned 1 year old the month before he died, but I remember listening to my parent’s records as soon as I was able to work the stereo. I had a huge Jailhouse Rock poster hanging on my bedroom door that my neighbor, Sara brought back from Sweden for me when we were about 10 years old. My brother gave me the book, Elvis and Me for Christmas that same year. I even liked to bring a little Elvis into my education. I chose The Essential Elvis Presley cassette tape as my prize for selling magazines in elementary school. My freshman year of high school, I had to give a persuasive speech. I may or may not have persuaded some 14 and 15 year olds that Elvis was still alive. 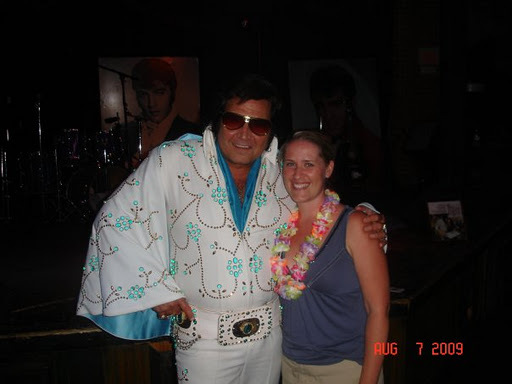 My senior year at The University of Iowa, I followed my roommate Kristi’s lead and took a class called Elvis As Anthology. I wrote a 30 page paper about The King and got an “A” in the class. 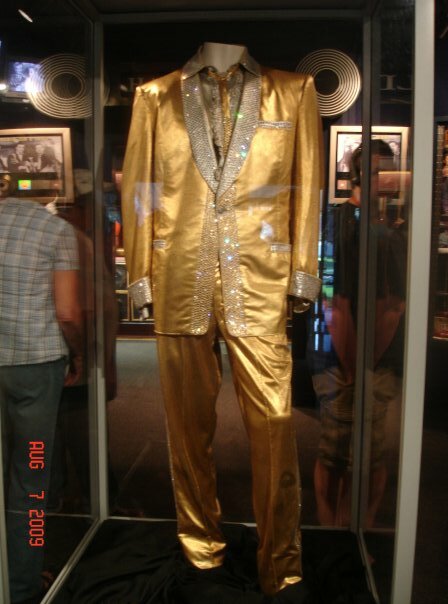 As the years passed, I accumulated more Elvis treasures. I have two of the swinging hip clocks, Christmas ornaments, t-shirts, a street sign, games, cd’s and a myriad of books. One of my favorite treasures is the Elvis Lava Lamp that my friend, Pam sent me a couple of years ago. I adore it, but I’m scared to death to put it out because of the kids. I think I have made the right choice since I have had to replace the lamp on my nightstand 3 times. Pam will always be my friend because she is the only person I know that has seen Elvis in concert. I still remember the day she told me. My jaw hit the floor. 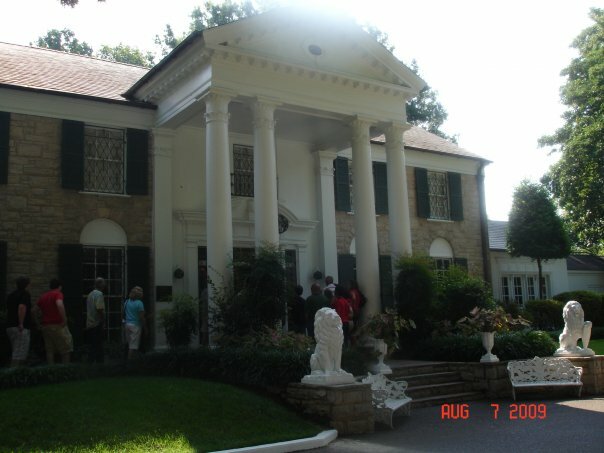 However, all of my Elvis paraphernalia doesn’t compare to my trip to Graceland in August of 2009. Ryan surprised me with a trip for our anniversary. 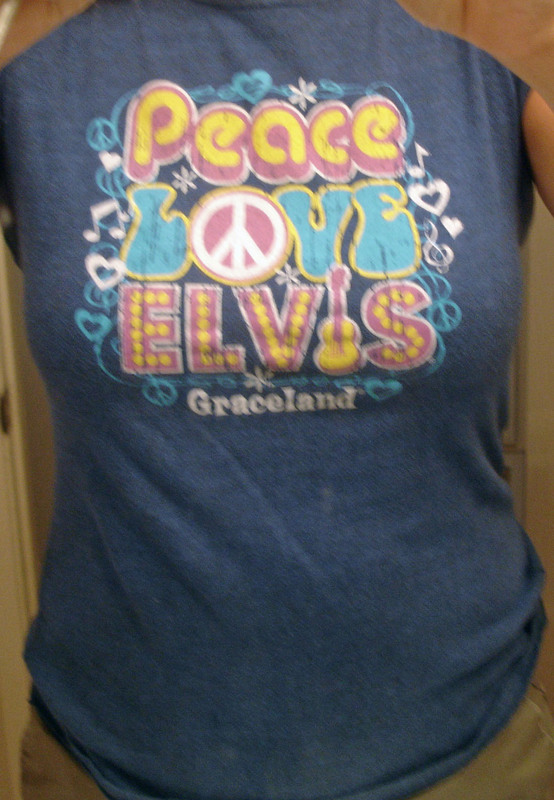 Not only was I finally going to the Promised Land, but I was going a couple of days before Elvis Week! Honestly, I think this was way better than being in Memphis during the actual week. 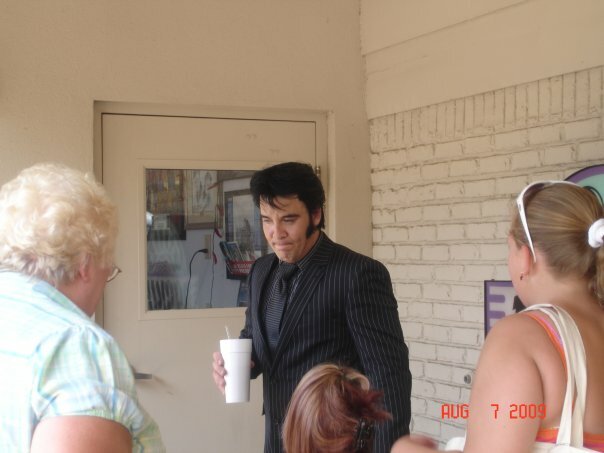 There were Elvis’ at every turn. Ryan commented “You can’t swing a dead cat without hitting an Elvis.” He has such a way with words. Here are some of the pictures from our trip. I had a stupid grin on my face the entire 4 days we were there. 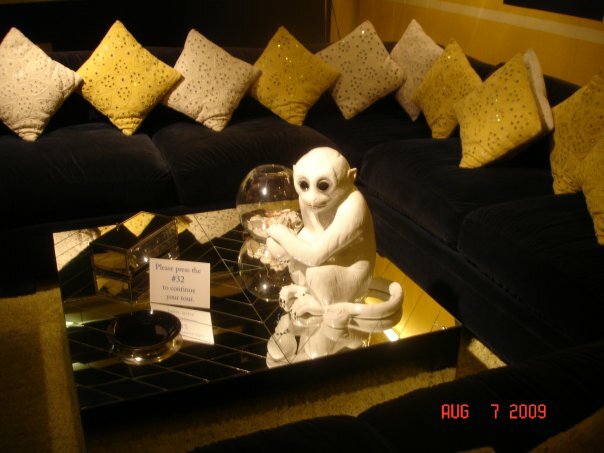 A crazy little monkey that was in Elvis’ TV room. I need to get my hands on that monkey. 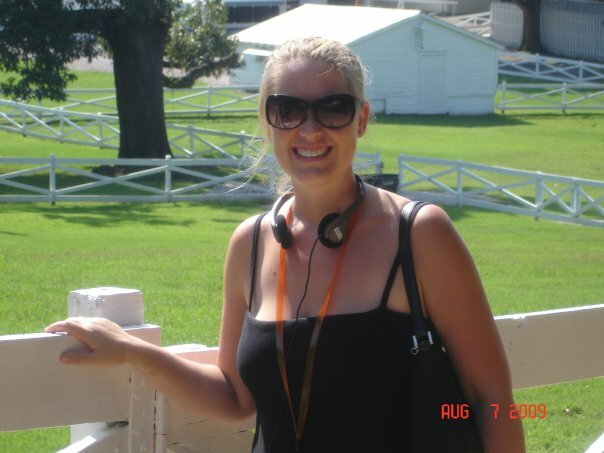 Hangin’ out in Elvis’ backyard. 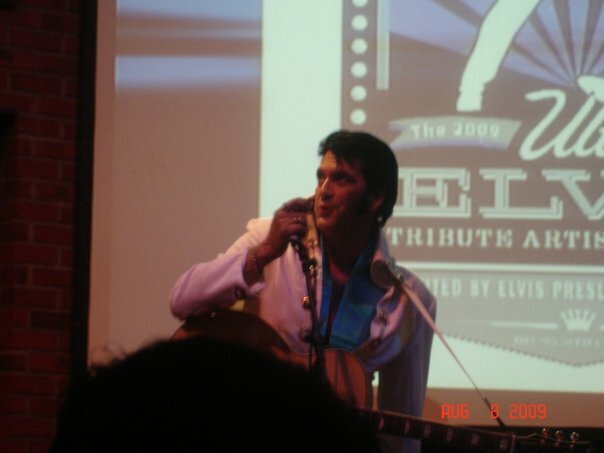 One of the Elvis Tribute Artists. 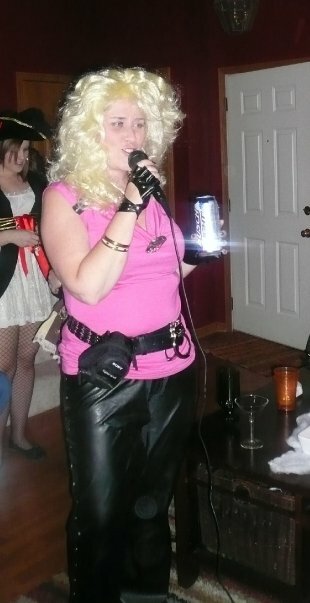 There were some good singers, but not one came close to being as sensuous as the real deal. 50,000,000 Elvis Fans Can’t Be Wrong. I stared at this for a long time. Just for the record, I also like the Beatles.